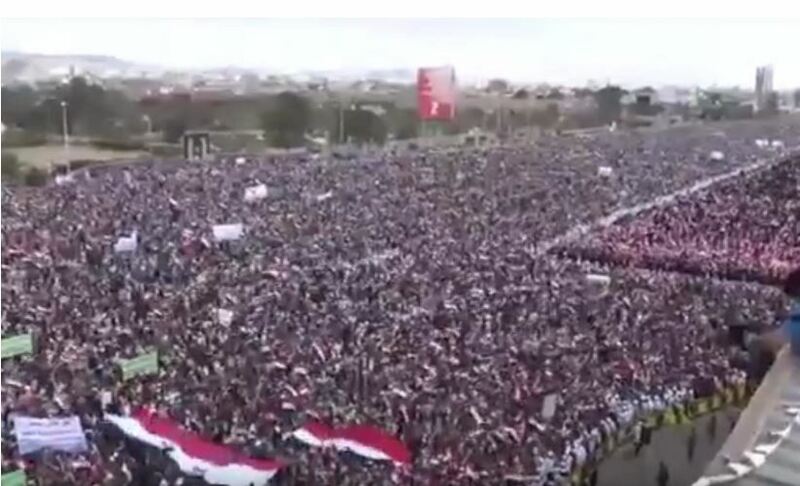 Two years after the start of the international war in Yemen, thousands of people in Sanaa have protested against the air raids of a Saudi-led military coalition. Protesters in the capital controlled by Houthi rebels waved Yemeni flags and called for chorus against “Saudi aggression”. The Saudis, led by the British along with the Americans, had been fighting for two years in Yemen. Yemen is very poor; millions of people are threatened by hunger as a result of the war. Not until mid-March was a refugee boat with Somalis aboard off the coast of Yemen from the air. More than 32 people died. Although no one was aware of the dead, the human rights organization Human Rights Watch said Sunday that the attack had been carried out “apparently” by the Saudi coalition. It had the airiness in Yemen. The rebels do not have an air force. Two years after the outbreak of the war in Yemen, according to UNICEF, more and more children are suffering from growing poverty, hunger and disease. In many cities, 462,000 children are affected by acute food shortages due to extreme food insecurity and the collapse of water supplies. This is an increase of 200% since 2014, the United Nations Children’s Assistance Office said on Monday. UNICEF called for donations and then called on the conflicting parties and the international community to prevent a famine and to provide the population with vital goods. The catastrophic effects of the war would not be seen enough in the wake of the numerous other international crises, UNICEF ​​said. Violence, insecurity, and the economic crisis would have made the social cohesion of the country difficult. Meanwhile, every single citizen of the poorest country in the region lives by less than two dollars a day. About two million children did not go to school, because it was too dangerous, but also because they had to work. From perspective lessness and despair, many parents have allowed younger children to be recruited by militia. Girls were getting married sooner, hoping that they would be better looked after. A few days ago, the International Committee of the Red Cross (ICRC) had also warned that several million people were threatening starvation in Yemen and Somalia due to war and drought.